Gender breakdowns of social media usage are instructive, and the subject sometimes of heated dinner conversations. 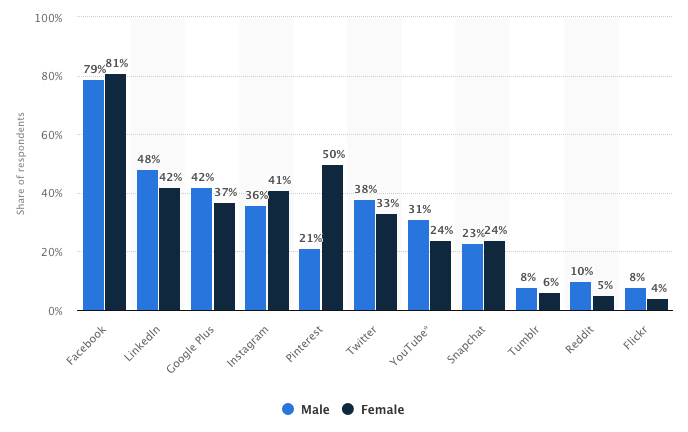 Debate this, for example: Why do more women than men use Pinterest? Here's Statista's May 2018 report on social media usage in Canada . . . by gender. The photo and video-sharing platform appears to be testing more broadly allowing public account holders "to manually kick people out of their pool of followers", functionality that has always been available for private accounts. Everyone's favorite hookup app is using Canada and Mexico as a testing ground for granting users the ability to send Bitmojis “to their matches within their chat conversations." Tinder product chief Brian Norgard explains that it is a "a playful new way to engage with matches." But isn't in-person 'engagement' (An odd euphemism don't you think?) — not ‘playful’ similitude — Tinder’s point? GeekWire reported that Snap is "partnering with NewsWhip, Storyful, SAM Desk, and Seattle-area startup Tagboard to give journalists a way to quickly find publicly-shared photos and videos taken by Snapchat users, including from the geo-location Snap Map." Your Snapchat photos could just end up on the nightly news!